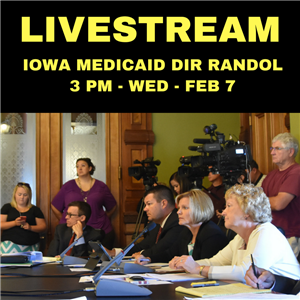 At 3 PM tomorrow, Wednesday, February 7, Michael Randol, director of the state’s Iowa Medicaid Enterprise, will answer questions from members of the Senate Human Resources Committee. Director Randol previously was the state Medicaid Director for Kansas. If you are able to attend, the meeting will take place in Room 22 of the Iowa Statehouse. Otherwise, you can tune in to our livestream on the Iowa Senate Democrats Facebook page. Amerigroup Iowa, one of the two private companies that run Iowa Medicaid, says it will begin accepting new Medicaid members. That means the 10,000 members who chose Amerigroup Iowa before November 16, 2017, but were temporarily transitioned to fee-for-service coverage under the state, will be moved to Amerigroup Iowa on March 1. They will receive more information from Amerigroup in the mail. New Medicaid members whose coverage begins on or after May 1 can choose Amerigroup Iowa or United Healthcare. They will receive enrollment packets in the mail with details on how to select their Managed Care Organization. Their health care provider is not in their MCO network. Necessary services are not available within the MCO network. The MCO has provided poor-quality care. They haven’t been able to get services that are supposed to be covered. To request a change for good cause, contact United Healthcare Member Services at 800-464-9484 or Amerigroup Member Services at 800-600-4441. You must go through the MCO grievance process, which can take 30 to 45 days. If your grievance is not resolved to your satisfaction, you may call Iowa Medicaid Member Services at 800-338-8366 for additional assistance. The final decision on your MCO assignment will be made by the Iowa Department of Human Services. Look for additional information in the coming weeks and months. For the latest updates, go to www.IAHealthLink.gov.